The scarcity of goods and resources forced families to reinvent themselves. In Matanzas, where electricity was available for only two or three hours per day, Kiki and Lesbia used dry coconut to spark a wood fire and cook fish in their patio. The smoke darkened her nails. I ask Lesbia if she remembers. She looks at me smiling, and a tear drops down her face. Even today, though her nails are not dark anymore, the memory of those years is like a scar that reminds her to appreciate what life has given her now, maybe a stove, maybe a small bottle of pink nail polish. HAVANA – This city is full of ingenuity. On one street, two men work together to pry open a manhole with a long, wooden stick. To counter the stifling tropical heat, drivers of the old American cars affix mini battery-operated fans to their dashboards. To trim the grass, workers use a tool resembling a large sickle. Internet connectivity is extremely limited, but Cubans still have access to current television series, music and movies via an invention known as el paquete, or the package. Once a week, an anonymous figure compiles the latest content onto a hard drive, which is then copied and distributed among a network of operatives. They camp out on street corners and make home deliveries so that everyone from millennials to senior citizens can get a copy of their favorite media. This is data traveling from hand to hand – a manual internet. When the idea of a closed, controlling government may insinuate a lack of agency or independent action for the Cuban people, they exhibit anything but. Everyone hustles to make ends meet. Some fly abroad and buy clothes in bulk to sell back home, which is “not legal, but not illegal,” according to one entrepreneur. Others supplement full-time jobs by running cooking businesses out of their homes or working as private tutors. “It’s a total mystery to us, but they make it work,” said Josefina Saez Acevedo, an American Christian missionary working in Cuba with her husband. For a country so often described as frozen in time, novelty peeks around every corner. MATANZAS, Cuba – My visit to the Museum of Slavery at the Castillo de San Severino in this seaside city, left me with a weird feeling. We learned that slaves in the Spanish colonial period were tortured – placed in wooden stocks in the fortress yard for days in scorching heat or punishing rain, or locked into heavy chains on sugar plantations to prevent escape. The history of racism in the United States and Cuba had many parallels until the 1959 Cuban Revolution, when Fidel Castro and his colleagues trumpeted the need for racial justice, opening the doors to work, school and health care more widely to Afro-Cubans. Racism in Cuba is not institutional, according to Raiko Valdes, a 31-year-old Afro-Cuban tour guide. Rather, it is about social class and economic status. He said that even though things keep changing slowly, the legacy of Spanish rule and post-colonial inequality is evident in the poor living conditions of many Afro-Cubans who live far from jobs, transportation and the best schools. After hearing one of my friends say that interracial interactions seem more common in Cuba than in the U.S., I wondered if the revolution succeeded in changing the mentality of many Cubans, after all, or only the constitution. COJIMAR, Cuba – Cubans love their Havana Club rum, their limes in their mojitos, their Cristal beers and the newer, stronger Bucanero beer. Unlike the United States, it’s not taboo to find a Cuban drinking at lunch and dinner. Alcohol is introduced to children at a young age, and perhaps they better understand their limits, although the official drinking age is 18. Most Cubans I talked with agreed that alcoholism and binge drinking is not prevalent. Pour 30 ml/1 oz. of raw honey into the glass. Pour 30 ml/1oz. of lime juice into the glass. Stir until a froth lines the top of the liquids. Add the spearmint; crush the stem, not the leaves, in the glass. Pour rum for 5 seconds. Top with ice cubes and sparkling water. After a week of drinking mojitos, I’m starting to feel like one. HAVANA – Somewhere near Jaimanitas, a fishing village west of Havana, there is an art community unlike any I’ve seen before. In this community, there is one work of art that pedestrians can’t help but stop to explore. And by “explore” I mean, walk in, through and around, because this work of art is actually a sprawling web of concrete and stained glass. Intended to represent the triumphs, struggles and values of Cubans, the structure is called Fusterlandia and embodies “the joy of living,” according to one promoter. The artist, Jose Antonio Rodriguez Fuster, is a Cuban native who initiated the project as a way to bring the community closer together. It seems to depict many of the Cuban ideals and realities I’ve come to learn about during my time in Havana so far, including the importance of social equality, strong community bonds and art as both an escape from reality and means of faint political expression. The exhibition, like Cuba, is brightly colored and beautiful but also seems to be a work in progress. (That is to say, construction is ongoing). 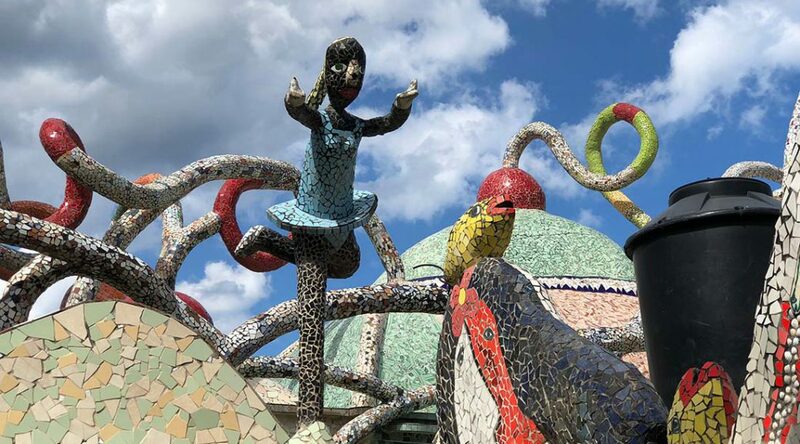 Walking through a sea of colored glass, ceramic and concrete, one can see impressions of children playing, two- and three-dimensional figures of men in fedoras, sunflowers, dogs, roosters and fish. The style suggests Gaudi and Barcelona’s Parc Güell, while some specific sketches and paintings seem to nod to Picasso’s early works. There is also the discrete illustration of an all-seeing eye. Making sure all are fed, sheltered, educated and medically treated. Making sure, too, perhaps, in a one-party state leery of dissent that no one strays from the party line. MATANZAS, Cuba – Everyone David Cortes-Fuentes meets in Cuba knows he is from the United States. But what most people don’t realize on first glance is Cortes-Fuentes is Puerto Rican, a distinction that changes people’s attitudes. Although the 2017 hurricanes did not hit Cuba as hard as Puerto Rico, Cortes-Fuentes says rebuilding after storms goes much quicker here. The government mobilized workers and diverted scarce resources to rescue and repair. Here in Matanzas, where Cortes-Fuentes and his New York-born wife work at the local Presbyterian Church, power was back up and running three days after the hurricane hit. Cortes-Fuentes, aware that power remains spotty in San Juan, said the lack of reconstruction in Puerto Rico is frustrating. “Here, they use what resources they even have to fix everything,” he explains. Many Cubans, anxious for better living conditions, tell Cortes-Fuentes about their families in Puerto Rico and their hopes to move to the U.S. territory someday. With reliable international news so difficult to find in the state-run Cuban media, he said the difficulty of Puerto Rico’s situation is not fully known to most Cubans. HAVANA – The takeaway from an afternoon of Cuban salsa in the back of a windowless Vedado nightclub: The music is in four, but the dance moves in three. No steps, spins or flourishes of much utility. Just the count, with a touch of self-effacement. Yet, a stunted, jabbing bout with salsa’s rhythmic inflection points was no empty souvenir. The lesson lay not in a step, but in a feel, an embellishment of perfect time employed by a dancer or a musician for expressive effect, and more illustrative of expérience vécue than any interview or lecture could be. None but the Cubans among the group had it. From a government tour guide’s exuberant moves emerged a burst of abbreviated steps in straight time, dabbing primary color onto a still-life of Cubaʼs soul. Another moved smoothly, but with intent. His steps touched the floor just behind the beat as though he were reaching for something, like a 1960s jazz player probing the strictures of form to reach a higher truth. Our teacher thanked me for coming. “You tried,” he said. I laughed. Certain things canʼt be learned in class. For Cuban salsa, you have to live them, too. HAVANA – After last night’s farewell dinner, I was really able to reflect on how much I’ve been able to interact with various Cuban people this past week. Even though I don’t speak Spanish fluently, I was surprised at how much I was able to understand. I felt like the couple of Spanish classes that I took in high school paid off and I was starting to feel confident again. And I could tell that they appreciate the effort of trying to speak their language. Cuban people are so open and honest, and that’s something I really admire about them. It’s definitely a contrast from America, where often people are hesitant about talking to a reporter or you have to go through a longer process just to score one interview. The trust that Cubans placed in us to do our job well has definitely stood out. They’re more willing to tell us their stories than I imagined prior to coming on this trip. And I wondered if it might feel somewhat therapeutic to tell an outsider their story. For me personally, I developed a special bond with Maria and Angel, the sources for a story I am reporting. That made it even harder to say our final goodbyes, but I’ve learned so much from them, and I hope they were able to learn something about American student journalists as well.